With four adults in the house, a baby on the way, three dogs, and very limited finances (I’m not employed, two of us have a part-time job or two, and one of us is employed full-time), things are pretty tight around the household. And I’m sure that many folks are feeling the same way. There is a lot of pantry- and freezer-cooking going on around here, especially now that MIL and I cleaned out the big freezer today to figure out what’s available! Because I’m not working (for pay, outside the home), and probably won’t be offered many opportunities now that I’m in my 7th month of pregnancy, I’ve offered to do meal planning for the family so we can save on groceries, and so I can try to build up a stockpile of healthier food while I’m “out of commission” for a while. Even better, having to meal plan for the family, instead of just the two of us, means I’m held accountable for posting every week! Bonus! Unlike the last time I tried this (almost a YEAR AGO), I won’t be doing a full day’s meals for the whole week, just suppers and a few desserts. Lunches can be taken care of with leftovers; and breakfast is a pretty routine affair, for me, and basically nonexistent for everyone else. With the temperatures as high as they have been lately, it’s been an ideal time for getting your grill on. It’s just not as satisfying to stand around a grill with a heavy jacket and skullcap, as it is to hang around in a tank top and shorts. At least, it’s not as satisfying to me. The other night, chicken was on the menu, but the seasoning decision was a little up in the air. We were cooking for the family, and while some of us like it spicy, others can’t eat anything much more than some barely-applied black pepper. Cullen had to step out for a while, so everything got left up to me. I decided I’d halve the seasonings between blackened and… something else. A few minutes of searching Epicurious yielded Grilled Lemon-Honey Chicken Breasts, and it sounded just like what I was looking for. 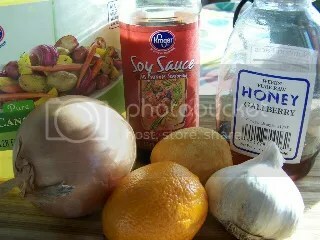 Even better, I had everything in the kitchen to make the marinade! Spectacular, astounding, delightful peanut butter cookies. On Monday, I had a serious craving for chocolate and peanut butter. I’m talking life-altering, here – if I didn’t fulfill the craving before the end of the day, my son would surely kick his way out of my abdomen and go find some on his own. As ever, I turned to the Internet, and it didn’t fail me. A one-bowl recipe with less than 10 ingredients, less than 10 minutes hands-on time, and less than 15 minutes to cookie heaven? Yes, please. Even better, the recipe has no flour included, though it does have quite a bit of sugar. (You can, in fact, substitute natural sweeteners if you so desire; one commenter used honey with no ill effects other than a shiny cookie.) Depending on your peanut butter’s sugar content, you may want to decrease the sugar just a touch, though it may affect your final product if you go too low. And be sure to mix the “dough” thoroughly – you won’t overmix it, but mixing until “just combined” may not incorporate all of the egg and vanilla. The yogurt maker sat untouched through Christmas, New Year’s, and weeks more. It stared me down every time I walked through the kitchen. How dare I bring it home and not show it love? After reading the manual, I was further filled with shame: so easy! Scald milk, let cool, add starter, fill jars, cook! Done! Exclamation! It was settled. Yogurt. Small doubts crept in – would I eat it all? I’m the only one that eats yogurt in the house, you see. Plus side, all for myself, and no bitching if anyone else didn’t like it, because hey – no one else eats it. See? Always a bright side. White-chocolate Browned-Butter Beauties (aka Blondies). I have a thing for browned-butter confections with white chocolate chips, so I find it hard to believe that I’ve slipped up and not posted these blondies before. These beauties are the reason for that “thing,” as a matter of fact. I don’t remember where I found the original recipe, but I don’t suppose it matters. Without the browned butter and white chocolate chips, these are just basic blondies. I added the browned butter one day by mistake – left it too long on the burner, back when I had no microwave – and the white chocolate on a whim. The resulting creation has ruined me for life. I was once of the opinion that blondies were – forgive me – nasty, and could never surpass the chocolaty goodness that is a well-made fudgy brownies. These blondies prove me wrong. Brown sugar, already a rich, velvety flavor on its own, caramelizes further when mixed with hot, browned butter. A stick of butter, at that – these are, in no way, diet food. They are a completely other animal and so utterly worth it. They’re delicious hot out of the oven – dense, almost flat and gooey – but let them cool overnight and marry all that deliciousness together… mm, it’ll make you wanna slap yo’ mama. (But don’t – that might be rude. Just get some icecream.) If anyone adjusts this recipe (adds flour, baking powder, craisins, wheat flour, etc. ), please let me know – I want to see how these can be altered for other tastes. I’m sure I’ll be trying my own adjustments at some point, just to get the rise I’m looking for without sacrificing that gooey, creamy mouthfeel. Besides the fast cooking time, these are essentially a one-pot dessert – you can mix everything in the pot you browned the butter in before pouring it into your greased pan. Just be sure to take it off the heat first. Grease or butter an 8×8″ baking pan and preheat your oven to 350°F (180°C). Brown butter over med-low heat, stirring slowly, until milkfat solids appear and butter turns a caramel color. 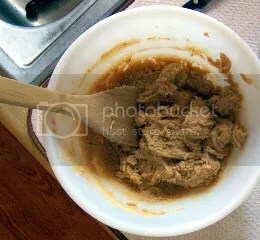 Remove from heat immediately and combine with brown sugar. Beat in egg until mixture is thick and glossy. Add vanilla and salt, stir, and fold in flour until just combined. Fold in white chocolate chips – 1-2-3 should be enough – and pour into baking pan. Bake on middle oven rack for 20-25 minutes, or until edges have browned and/or a toothpick comes out clean. Let cool in pan for at least 10-15 minutes before cutting. Serve plain, or with icecream and caramel sauce.